SensEnomics™ monitors and reports breaches in temperature that affect food safety. Your brand reputation takes years to build. Food temperature control and incomplete temperature logs affect county and state inspection scores. 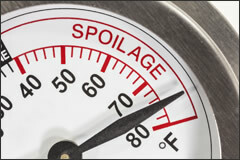 Undetected temperature failure can affect food quality and consumer safety. Brand reputation can be irreparably damaged. Our sensors log temperature data every 10 minutes for accurate up-to-date compliance records, peace of mind and consistent food quality. High staff turnover increases the risk associated with inconsistent food safety best practices. 24-hour automated temperature monitoring identifies best practice and compliance violations that place your operation, and your brand, in peril. Wireless temperature sensors detect equipment malfunctions before they impact operations. Receive important alerts when temperatures reach the danger zone. The latest in wireless sensor technology with no capital expenditure, our Sensors by Subscription™ plan is an affordable and essential component for temperature management and food safety compliance. "When in doubt, throw it out" mindset no longer applies.